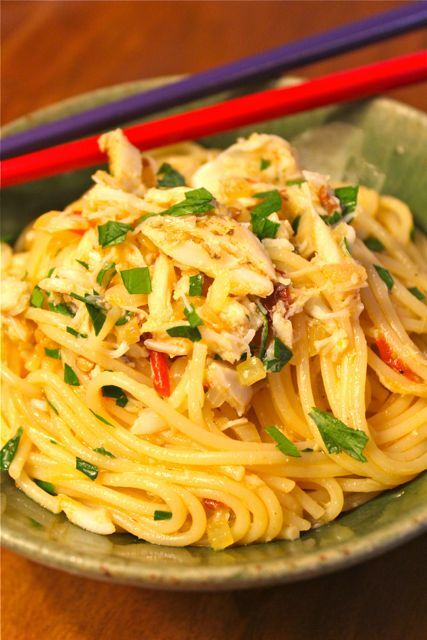 This is one of the more unusual fusion recipes I have come across… using Italian spaghetti with crab, sambal from southeast Asia, preserved lemons from North Africa and several other western ingredients. 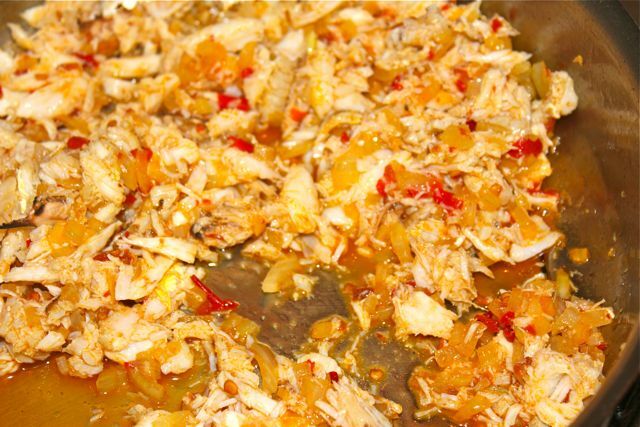 But it is an absolutely delicious dish, and the perfect way to make use of say 500-700 grams of peeled blue crab meat (leftovers from a dinner for relatives). I featured the Gourmet magazine recipe before, here. Some sauteed onions in generous amounts of olive oil fuse with several heaping teaspoons full of sambal oelek. The cooked and peeled crab meat is added just to heat through, adequate seasoning of salt and pepper added, several dabs of butter to finish the sauce and smoothen out the flavors and some hot spaghetti, minced homemade preserved lemon rind and some chopped italian parsley complete the dish. It took less than 15 minutes to make, start to finish. You could add some fresh lemon juice to brighten it all up if necessary. 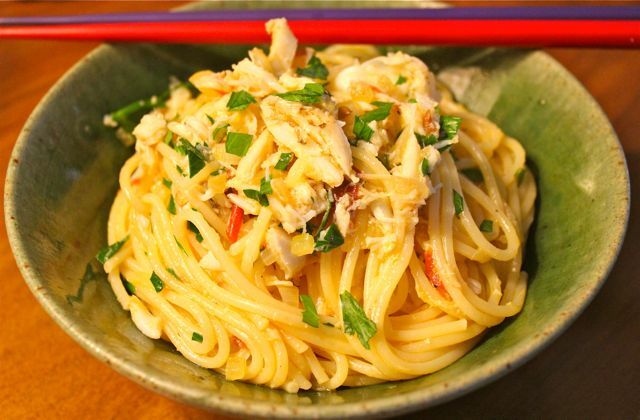 You want generous amounts of crab meat per portion, so don’t skimp. I suspect this recipe would also work nicely with very small shrimp as well. Nice! Good eat on a rainy day. Will try it but first, have to make preserved lemons. I like the vessel and the colored chopsticks — can almost taste what it holds! I need to try this! I eat everything with Sambal :-). Is this pottery part of your nice finds at the market? Monique, the bowls were from an Art in the Park event a few years back, I can’t recall the name of the potter.